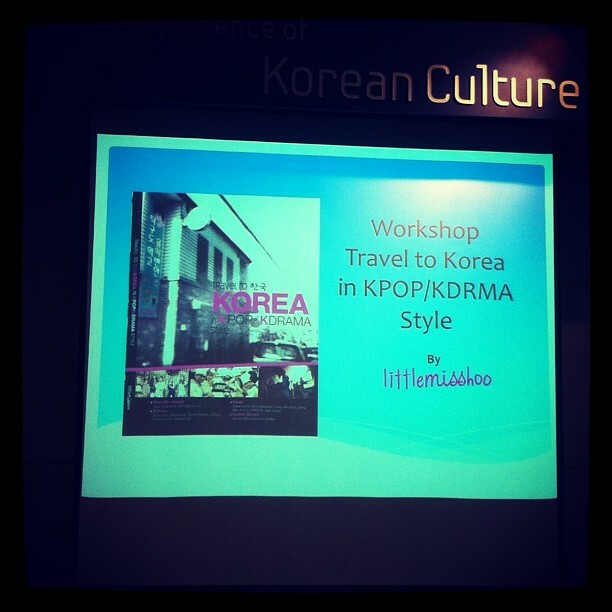 Yesterday, I was attend Workshop Travel to Korea in K-Pop and K-Drama Style by littlemisshoo or Miss Rose Hoo. This event is on 9 March 2013 (Saturday) at Korea Plaza, KL. This workshop have two session - first on 12-1 pm and second on 2-3 pm. This event is under Korea Tourism Organization (KTO) Malaysia, - for helped all Kpopper that want travel to Korea and at the same time want to visit some place that own by K-Pop Stars. It's sound great, right?? Actually, littlemisshoo is the writer of the book "Travel to Korea in K-Pop and K-Drama Style". She love so much, watching K-Drama and she also wondering where the place that they make shooting, so she travel to Korea as free and easy - to go every location of K-Drama shooting location in Korea. She make this book by going travel to Korea almost 4 months to complete her research about K-Pop and K-Drama location in Korea. In this book, she give detail of simple direction how to go the place of K-Pop or K-Drama shooting location by bus. Every direction, she put the picture of it, so it easy to follow and this book in English. So all Kpopper can visit any location of K-Pop or K-Drama by follow the instruction in this book. She also give information of the place, for example - the place own by who, time to open, address and what number of bus to take. Sometimes, if you are lucky, you will bumped into any artist K-Pop when you visit Korea.. (^_^) That great, right?? After finish this workshop, I take an opportunity to take picture with littlemisshoo that just left me on this picture. She so nice and she also give some tips to me, if want to take picture of any autographs of K-Pop Stars in any shop that you visit soon, please ask politely to the owner of the shop - sure they will let you take picture of it. Other tips - if you can speaking in Korean even thought only little bit Korean sentence to the Korean native, sure they so happy and they will give you guys some gift (depend on the owner). But most of them, they so happy when foreigner like us can speak Korean and go travel to Korea - at the same time we love K-Pop. If you want to get one of this book, you guys can try to get at Kinokuniya, KLCC or any bookstore in Malaysia. The price around RM 67++, I not sure the price at bookstore because I buy it, RM 50, after this event finish. This is special price to us that attend this event yesterday. But don't worry, because you guys also can visit her website : www.littlemisshoo.com for more information. Special Holiday is Wholesale Tour Operator in India, recipient of National Tourism Award presented by H.E The President of India, International Quality Award from Europe & also World Travel Brand Award, to name few. We have our own transport fleet and offer most attractive deals for tour packages, hotels and car rentals. [Travel] The Way to Planning Holiday at Big Bang G-Dragon’s Dolce Vita Hotel. [News] The Second Branch of Tous les Jours at Bukit Bintang, Kuala Lumpur, Malaysia 2013.